Standing may not hurt your coccyx, but if you do it for too long it can cause other problems: tiredness, aching back, aching feet, aggravation of varicose veins, and so on. One particular problem that can develop is plantar fasciitis. Plantar means the foot, and fasciitis is inflammation of the fascia, or fibrous tissue enclosing and connecting muscles. It is a common problem with people who work standing up, particularly if they are over 40. This condition is sometimes called heel spurs. 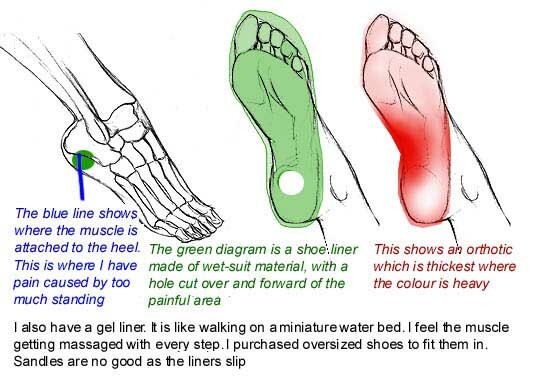 There is a good site with information on plantar fasciitis. To avoid these problems, try to alternate standing with lying, kneeling and sitting (on a suitable cushion). Remember to shift your weight about while you stand, and try to take a little walk from time to time. 'Cashier's mats' are available to make standing on a hard floor more comfortable. These are mats of foam rubber or rubber fingers. You may find that standing on a thick comfortable mat or carpet without shoes is more comfortable. It is important to have comfortable shoes. I find trainers and flat sandals the most comfortable. You will know what suits you best. You can buy foam rubber insoles to improve the comfort of your shoes, but usually the foam is weak and flattens after a few days of standing. I found the best solution for me was to buy a 10 millimetre thick sheet of industrial silicone sponge rubber and cut insoles out of that. Because it is so thick, this only works with sandals with two adjustable straps. Sally Cowell has plantar fasciitis, and was given an orthotic (a support moulded to the foot shape) and was advised that wet suit material is the best for making strong insoles. Here are her diagrams of them.